Wheelchairs are one of the most common pieces of medical equipment needed around the world. They are also rather expensive. The existence of a wheelchair can mean the difference between begging on the street and leading a fulfilling and productive life. I wanted to design a chair that the disabled person could use on their own without being pushed by another. In order to accomplish this, a sturdy frame was needed. 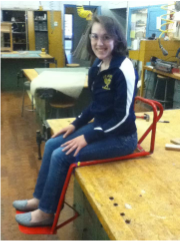 We decided upon using a steel hand truck as a base and bending it to form a chair. The large wheels are bike wheels and the small casters are wheels from the hand truck. You can follow out progress by visiting our Blog.